How fun was that!! And beautiful as always. Want to try this one for sure. thanks for always thinking outside the box, Wendy! On my way out to the art shed to try this immediately! You ALWAYS inspire me with your great tips and trix. Will for sure try this one BUT have to get some rubbing alcohol first AND distress spray. I only have the stain. I am off to Whim So Doodle today. 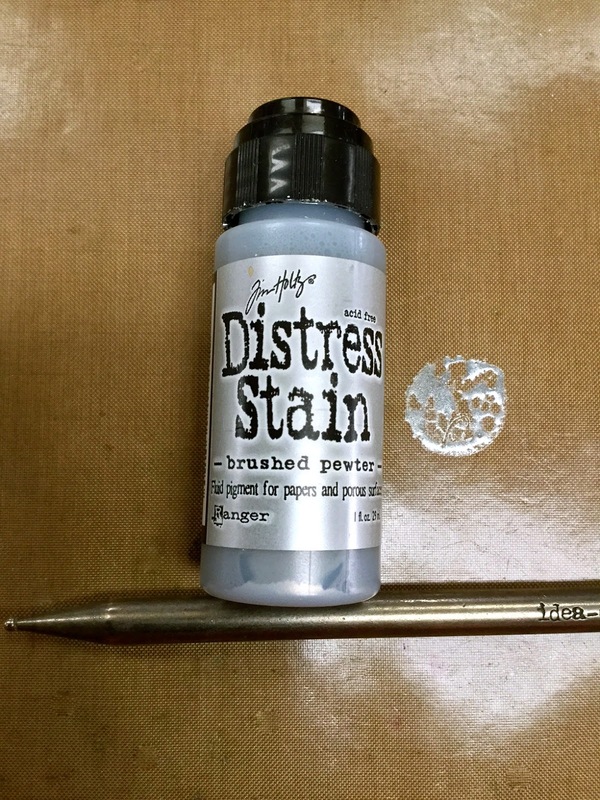 Hopefully to get the new Tea Rose ink and Embossing Powder, which I love! I can't wait to try this technique! Great effect ! It's always good to say "hmmm ... what if ...". Thanks for doing that & sharing the results ! Cool technique! Will try this as soon as I get some picket fence spray stain. I'm thinking cornflower blue and orange blossom would be a fun combo. Megan and the ruffle border need to come live with me. Thanks for the inspiration. Incredible technique! Love your tags. I'm adding this to my Pinterest board to remind me to give it a try. Thanks for doing the experimenting for us! Love this idea! I'll definitely give it a try! Fabulous technique. Can't wait to give it a try. I love this technique. And cant wait to run it! Tge slot in the back of the watering can is genious! That's a fab technique I gotta try it! And I'd love a chance to win the stamp set!! This looks like fun! As soon as I clean off my desk (crafting with my grandkids :D) I'll have to give this a try. That is so cool. Great tutorial. I need to try. Thanks a ton Wendy. Great technique - must give it a go. I fancy burnt orange and a green. 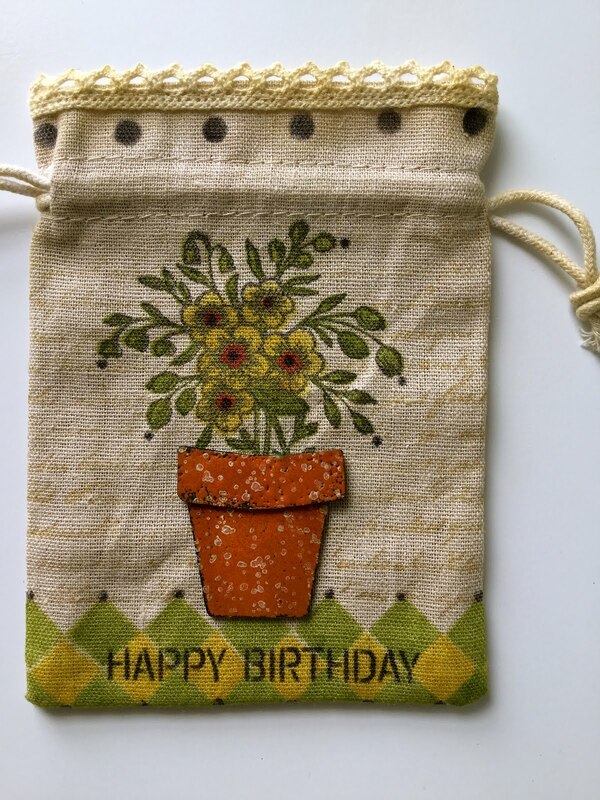 What a great look, and I love the tip of using the sakura glaze pens for the flower centers. I know Iwould be over the moon to have Molly as my new creativity friend! Oh wow this looks fun. Seeing that I just had shoulder surgery and attempting to just survive using my left hand is an experience. I better put this technique on the back burner. I can just see my face covered in spray and trying to explain to my hubby what I did. Really like this technique. I want to play but will need to purchase some ink pads and rubbing alcohol. Beautiful outcome. Thank you for sharing. I love this technique! It is so beautiful. Thank you for continuing to teach us new ways to work with products we already have! I love new techniques! This is amazing and I can't wait to play with this. What a fun technique! 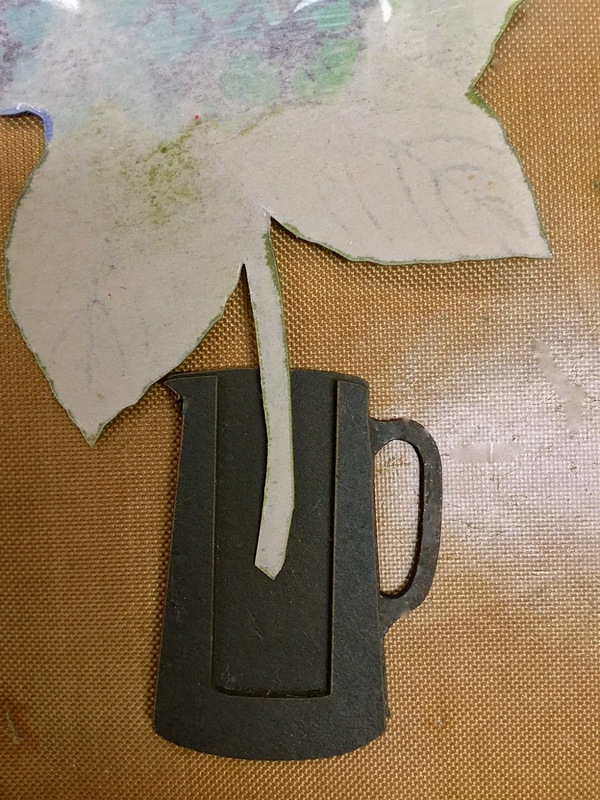 Thanks for sharing your experiment with us, I love seeing how products play together in our art! Fantastic use of material!!! Thanks!! This is so cool! 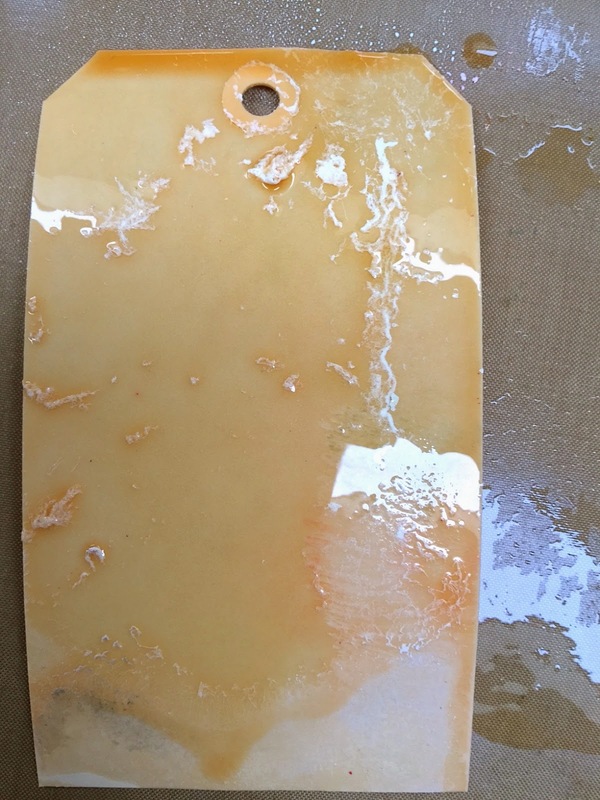 Love your tag and can't wait to try the technique. Wendy,you have such a unique artful eye which I find very refreshing! I really appreciate your style and talent! what a great way to use products you already have on hand. it is fun to experiment sometimes you know the old saying: there are no mistakes in stamping just happy accidents! You are amazing. that is so cool!! OMG, I love this technique. I will for sure try it and thanks again Wendy for sharing such great techniques. I want to try the colors cornflower and potting soil. Beautiful gve away...like that lady very much. That's an awesomely cool technique! I'm sure I'll be trying it out this weekend. Thanks for all the fabulous ideas! Wow! Cool tech! I love the looks of that! Will definitely have to give that a try! The finished tag is awesome! I love this new technique! Thank you so much for sharing. I'm off to give it a try. What a funny texture! I'll have to play now... ;) thanks for sharing something new! And I love the stamp set ur giving away! What an amazing effect. Thank you for doing the groundwork, so that we can benefit from your experiment. Will have to go to my table and make something cool. Thanks again. How cool is that, plaster look with no plaster. And yes, I love that new ruffled stamp. Thank you. Oh my stars! This is just the best technique ever!!! And that stamp set is p-e-r-f-e-c-t for the love of your life!! You know, that special day is just around the corner. I need people like you to make me think outside the box. I'll have to buy some distress spray and try this technique. Love this background...have to do a couple cards today and am going to try it! Called a friend to come play and try it too! The house can wait! 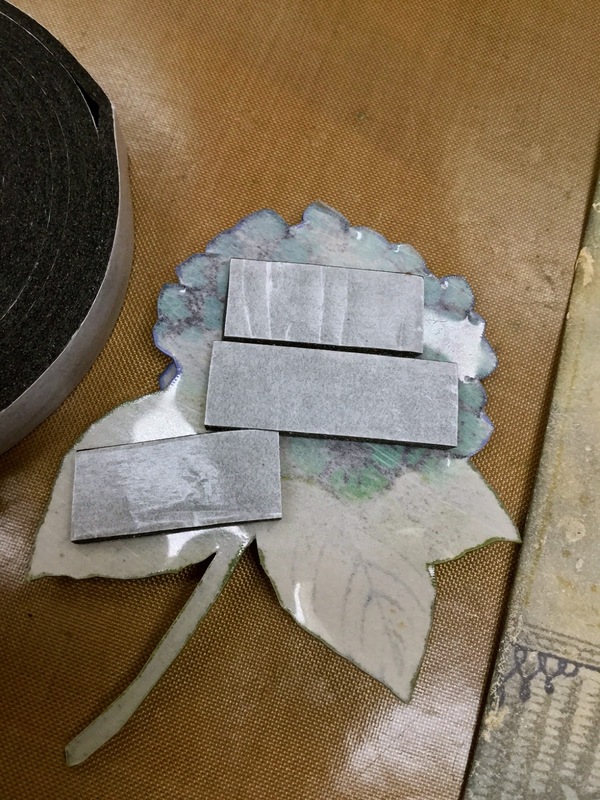 I can't wait to own the tea rose ink and embossing powder. What an awesome technique! My head is swimming with all the possible color combinations for this and I cannot wait to try it. Oh, and the hydrangea SiSi and flower pot are on my "just gotta have it" list. 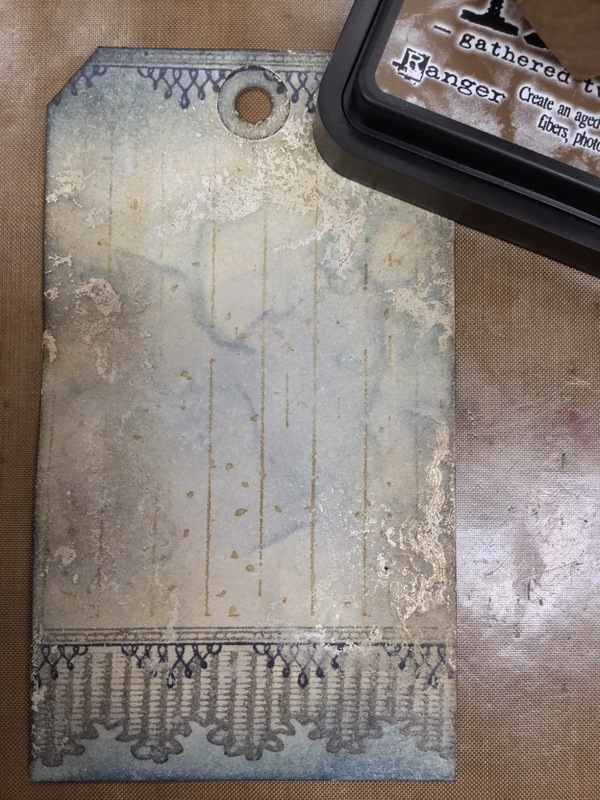 Gorgeous tag, inspired technique and clear instructions. It doesn't get better--thank you! I love the effect, I'm thinking Tea dye/Antique Linen or Tattered Rose Spray Stains with Archival Leaf Green. Megan & her ruffles are more than welcome at mine! I always love to see new uses for my inks and sprays! Great technique for many future projects. Love your products! You are such an inspiration to give one the incentive to try out different and unusual ideas and methods. Thanks for taking the time to explain it all in such detail so that we can experiment. That stamp set would be awesome to have. Thanks for the chance to win it. Awesome technique! Can't wait to try it with Orange Blossom and Leaf Green...my two favorite colors! Love your technique! Always fun to get inky! That technique is beyond amazing. This is why I love visiting your site. You are so inventive and have the most amazing tutorials! That was a great idea and look forward to trying it some day! Yes please, I would love to have Megan she is a perfect and amazing stamp! WOOOOOOOOOOO ... Woman you ROCK !!! This experiment is AMAZING ... I LOVE the texture... OMG ( gotta try this) ... I don't have new colors BUT I'm gonna try orange blossom and cornflower ... I think they'd be cool... I'm just experimenting right ... you may never know LOL !!! Your tag is over the top fabulous with those stamp techniques... Ummm I NEED Meagan and that border .... Pssst RICK ... over here ... LOL !! Thanks , Wendy I like playing with you! Oh, Miss Wendy-Girl! I am not leaving my house this weekend! I can feel a full blown obsession setting in! Every little bit of this tag is gorgeous! 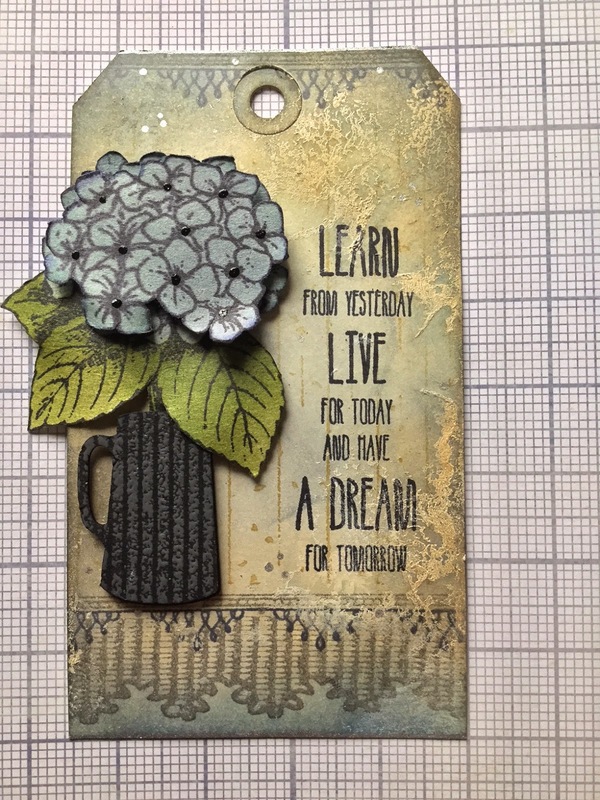 The smokiness of the background, the texture of the "plaster," the layered stamps, the flower, the vase, and those little black flower centers! Holy Cow! Fabulous! What a great background! Can't wait to try it. And I love the rest of the tag. The stamp set is lovely. Rick, Please, please pick me. I would love, love, love to have this stamp set. Thank you. You're the best! Wendy, Thanks for showing us this new technique. I can't wait to try it. Whatever combination I decide to try it is just a cool effect and I can't wait to see the results. I love Wendy's Art and would love to have this stamp set to try out on some of my newly created tags. Thanks for sharing. The splattered plaster technique looks awesome, will try to give that a go this w/e and the ruffles stamp could easily become a favourite :-). Thanks for the chance to win some goodies. I love that stamp set!!!! Very cool technique. Can't wait to try it out. Gorgeous would love to try this technique ! What a great technique for backgrounds! I am completely blown away with the results...it is creative chemistry! Must try this technique. Love anything which gives random results! It always comes as a surprise!!! This technique is beyond awesome! 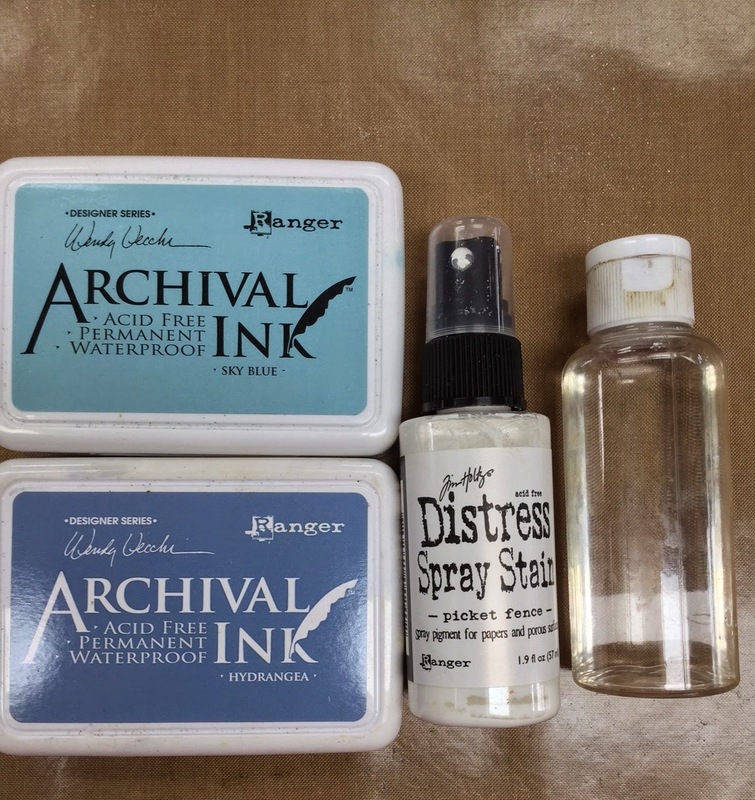 And I already have everything you used to make it except the new ruffle and wood floor stamps and new Archival ink colors! Make my dreams come true and pick me! I'm off to try the "curdling" technique for some Valentine tags! Oh, I'd love a new stamp set!! I was taking down my Christmas tree (finally!) 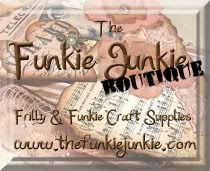 but now I just have to go and play with some crafty goodies. I don't have the same goodies, but I do love playing around and discovering fun ways to use mine! I would do some blues, since I am working on a baby boy scrap book for a shower. That is an amazing effect and I will definitely play around with it too! 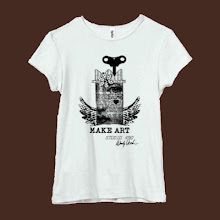 I think you have a little bit of a mad scientist in you...lol... in a good inky way! 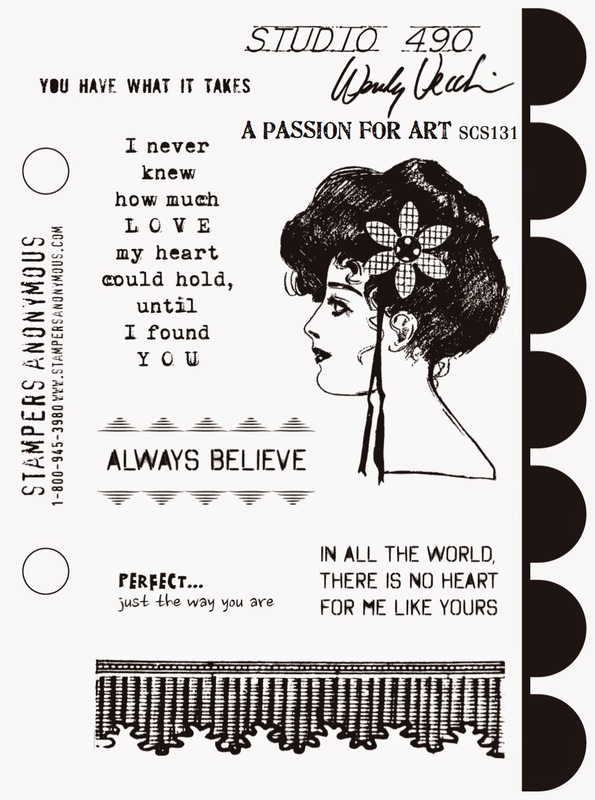 I'd LOVE to have the A Passion For Art set... such fun stamps! What a cool effect! And Love, love, love the stamp set! Such a great technique. Thank you for sharing. I would make a lot of tags at once and put them away to stamp and embellish later. The colors - I think I would first try potting soil and orange blossom. This is a must have stamp set for me. Chances of actually winning ???? So is it for sale yet???? Really need it for Valentines. creativity often makes messes and art know which ones to keep! OH WOW!!! I just tried this and LOVE it!!!! Made a couple tags and then went with a whole sheet of cardstock because I had a lot left over and didn't want to waste. Thank you so much for the inspiring new technique!!! Love the technique, it looks so cool. Thanks for sharing. Your technique makes great looking backgrounds, and I think even I, can pull this one off! 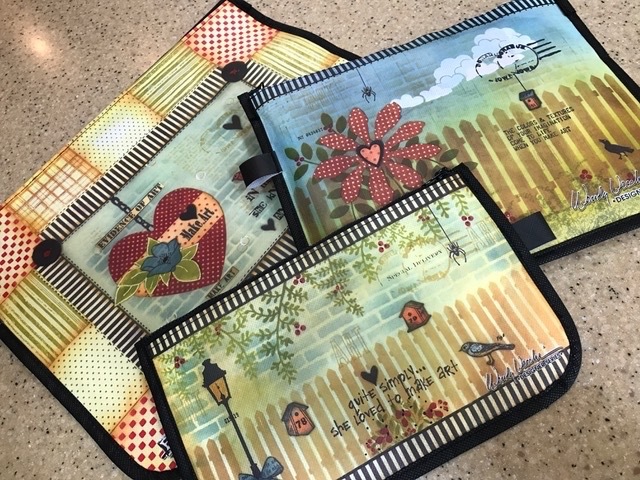 Thanks Wendy for this idea and for a chance to win this beautiful stamp set! Love this technique...what an awesome look! I am totally in love with the ruffled border...coolest stamp ever (and that's not to say I don't love the rest of the set)! WOW........wonderful as always! Great technique, I will try! You are such a clever girl! Love this technique. Oooh, this stamp set with Megan is my favorite one. Thanks for the chance to win it. Wow!! Love this technique, and that stamp set is great!! Thanks for the chance to win!! it was a fantastic technique which totally made me want to get the things to do it. so great. thanks. sounds like a plan....lets get inky! I also love to find new ways to use what I have on hand, thanks for the chance to win something new to experiment with, too. 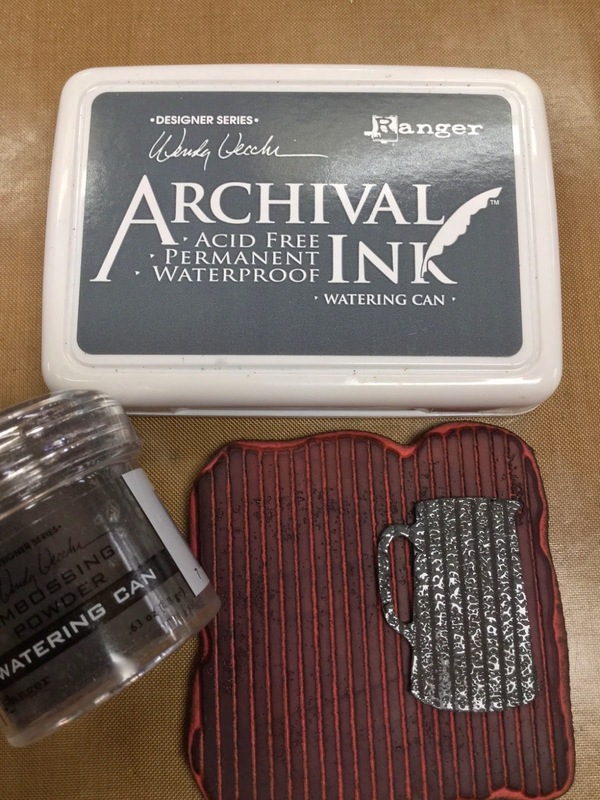 I have some of those products and would love to add the stamp. I'm go8ng to try this technique this weekend. WOW OH WOW!!! You never cease to amaze me! You are the technique queen and the way you experiment with things blows me away. I would never have thought to do this! You ROCK, and I can't wait to try this myself!!! WOW!!!! LOVE Megan too...whoever gets her is LUCKY!!! Thanks Ted and Wendy for being so generous!!! I never would have imagined it would turn out so beautifully at first. Loved seeing the progression, fabulous tag. I would LOVE to win these stamps! What a great giveaway! I really enjoy your techniques. This one looks amazing and is one I will definitely be trying! I'm thinking I may try some blues and greens. And will have to try some pinks and reds too! I can not wait to try this, it looks amazing. 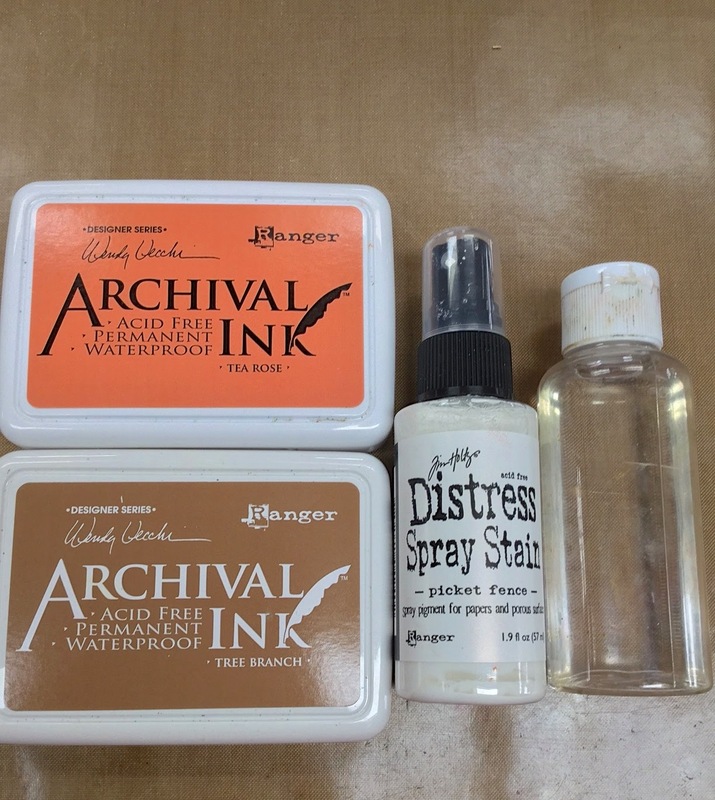 I have all your inks and the new ones are on order. Looking forward to playing with them. Gotta run to the store for some rubbing alcohol so I can play. Thank you so much!!! What a fabulous technique! I cannot wait to try this. You are incredible! Love that stamp set & would love to win. What a great tutorial. I will have to try this, maybe with yellow and blue. Thanks so much. It's about to snow on the east coast. I'm headed to my craft room to try your technique out. Maybe red geranium and magenta hue for a valentine themed tag. Love your products! Love this tutorial. I'm leaning toward green/blue and some white or pewter, I think. Wish me luck trying this! Usually my first efforts are dreadful! But I do persevere. Thanks so very much for your ideas which keep us all going! Looks like fun! Your tag is beautiful! I just love it when someone creates a new technique using products I already have. Great tutorial!!! This is just fabulous - just finished watching you on youtube at CHA and am now in craft room trying out the many different and wondrous things that you showed! Who new metal could be made to look like enamel at home! And now you have topped it off with making plaster at home!! Wendy, this is such a great technique. I can't wait to try it. I need to check my supplies to see what I have and jump right in. I need that Meagan set, that ruffle is so beautiful. Thanks for the great tutorial. This is an awesome technique! Your finished tag is amazing. Thanks for the tutorial, and also for the chance to win the great giveaway. I love the cottage cheese plaster technique! Down right awesome! Love your inspiration. I am looking forward to trying out this technique. super cool!!!!! I will certainly be trying this with different color combos. Love the shabby chic effect you got on some of the tags!!! Very cool technique!!! And I must say I would never have purchased the old wood floor background stamp if I didn't see you use it. I love the look of it stamped!!! Keep up the great work!! Love this technique! Can't wait to try it. Love this stamp set. Thank you for sharing! Picket Fence Spray Stain has now jumped to the TOP of my shopping list. This technique is outrageous and gorgeous - sheer genius to come up with this idea, Wendy. Brava! This technique is amazing. Will it work with other spray stains as well? Have you tried any others? I love it! Thank God for wonderful, artistic people like you! OMG, this is so amazing. I love it. Can't wait to give it a whirl. AND, yes, I would love to win the giveaway. Thanks for the inspiration. You think like a chemist! Not that I'm a chemist, but I'm married to one! Great look and I will most definitely give it a try! Fabulous technique. Thanks for sharing the instructions and photos (for us visual learners). Wendy - your experiments turn into dynamic ideas. This is a great technique which I plan on playing with this weekend. 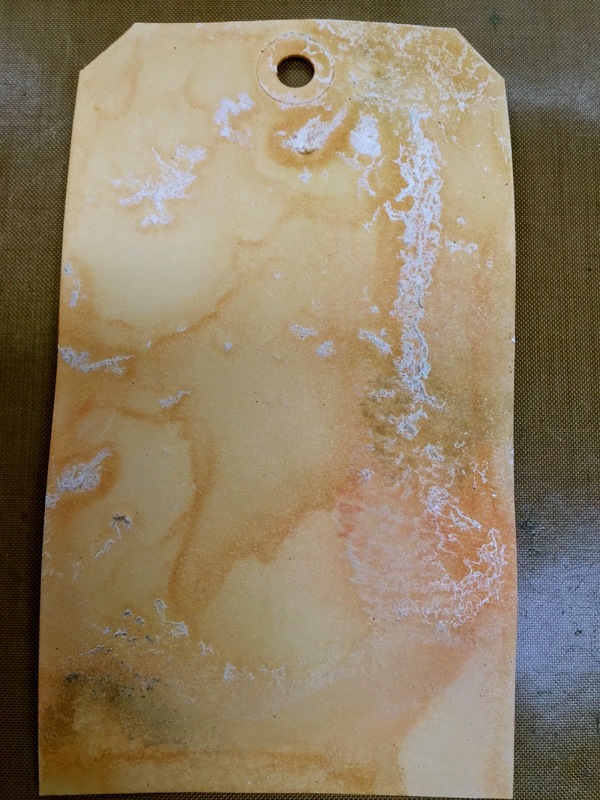 Think I might try the orange blossom - amazing textures here I come! Thanks Wendy! You are the mad scientist! You must have been a fun student to have in class (art or science, of course). I love your out-of-the-box techniques and can't wait to try this one. I love your other alcohol technique and use it often. If this is even possible, I love an intentional "Happy Accident". Learning to not be so clean when I craft, this looks like a lot of fun and I will be making some tags with this technique. Thank you for putting a circle inside of a square so to speak. I LOVE IT! Everything you released this time is wonderful but my favorite is Meagan!!! Your creativity is so incredibly inspiring!!! Everything you have made, including the painting using Dina's paints are beyond beautiful!!! Rick, besides picking me, will you please talk your lovely wife into coming back to Boiling Springs, NC? :-) We learned so much when she was here and had the BEST time. And please come, too. Heard so much about you; we would love to meet you! 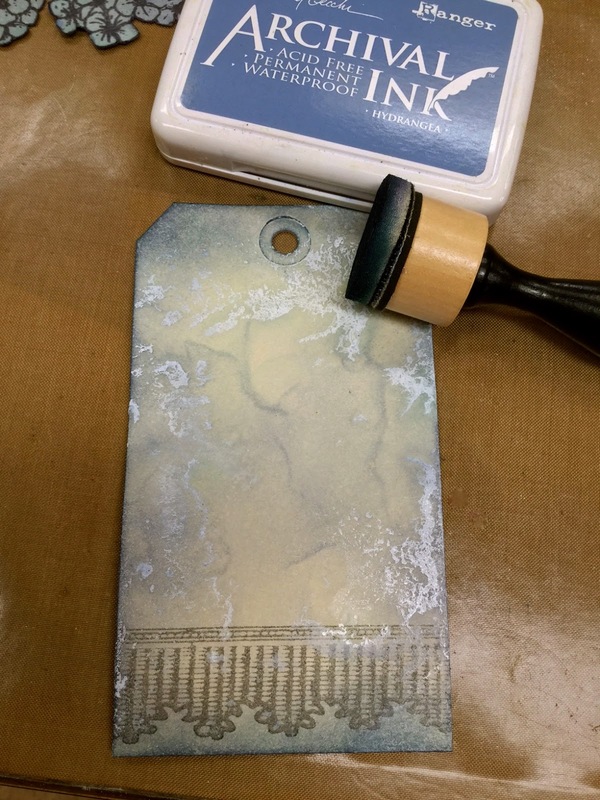 I love the new technique and will definitely be giving it a try.I love the stamp set as well. Gorgeous tag, love your plaster technique. Can't wait to give that a try. Thanks for the chance to win. Always love seeing all of your pretty creations. I cannot wait to try this technique. Your tag is beautiful. What a beautiful finish you created. I can't wait to try it myself. Thanks for a chance to win the stamp set in addition to sharing your terrific ART! thanks for all the tips - love this technique will be trying it out soon ... maybe this weekend! Love, love, love this technique. Can't wait to give it a try! Thanks for sharing all your amazing tips and the great inspiration with all your projects!!! Love all your work and ideas, but this one is out of this world. So impressed I am posting for the first time. Thanks so much -- you are an inspiration! Love it! Going to try right away! i love all your archival ink colors so I'm going to try a bunch of combos. What a cool effect. Thanks for sharing your genius. "Perfect. Just the way you are". My husband has told me this so many times.....this just jumped off the page at me. Thanks, Wendy. Love the new stamps and techniques. Love your detailed, yet easy to understand instructions with clear, close-up pictures to match. Bravo!! Love the simplicity of this technique and the amazing result. The ruffle stamp is a must-have! So hmmm. What colours am I thinking? Watering can and cornflower for the background. Going to try this first thing tomorrow am!! Love the technique. It put a huge amount of ideas in my head to try. Oh my God Wendy! That is so cool! I just tried it and I am totally flabbergasted. Discombobulated, supercalifragilisticexpialidocious, I'm speechless I just can't come up with enough adjectives. This is incredible.I used French ultramarine and hydrangea and it created the most incredible shade of blue with the picket friends sprayed on it and I want this on every wall in my house. I can't wait to try other colors and color combinations. I don't think I'll ever get tired of figuring out color combinations to try! You are the bomb!matter-of-fact, I don't think I'm going to sleep tonight. It's midnight in Connecticut, and I don't think I'm going to go to sleep I'm so excited. Oh my gosh. I adore this stamp set and would feel very privileged to win your generous give away. I'm loving the the new technique and will try it tomorrow. Wow !! what an awesome technique ..Loved it ..Thanks for sharing this with us ..The tag looks so beautiful !! You have an amazing mind! I never would have thought like this. Lovely Tags! Oooh how beautiful; you are really so inspirational Wendy! 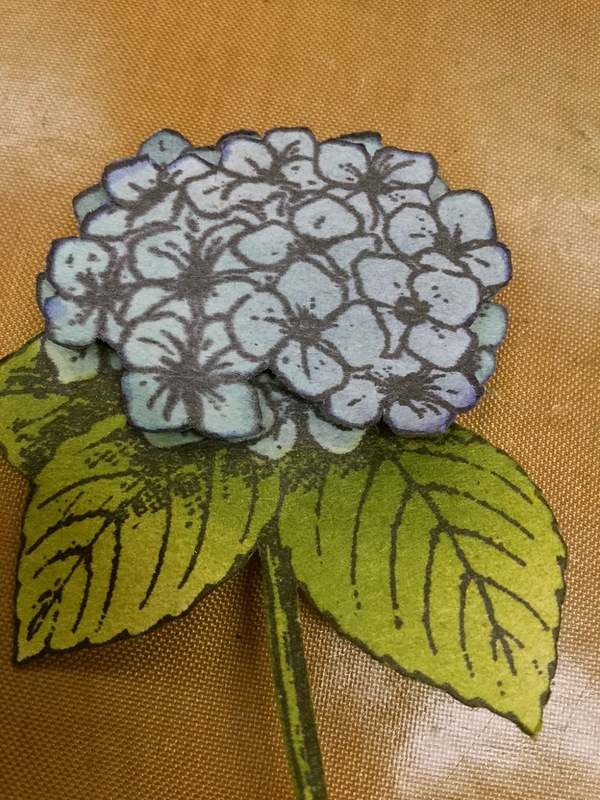 I just love seeing the results of your 'experiments'....so beautiful especially the attention to detail....the hydrangea little centre dots & the effect of offsetting the flowers....& & the lovely little glossy pitcher just exquisite! Thank you. You are absolutely brilliant! I truly love this idea! 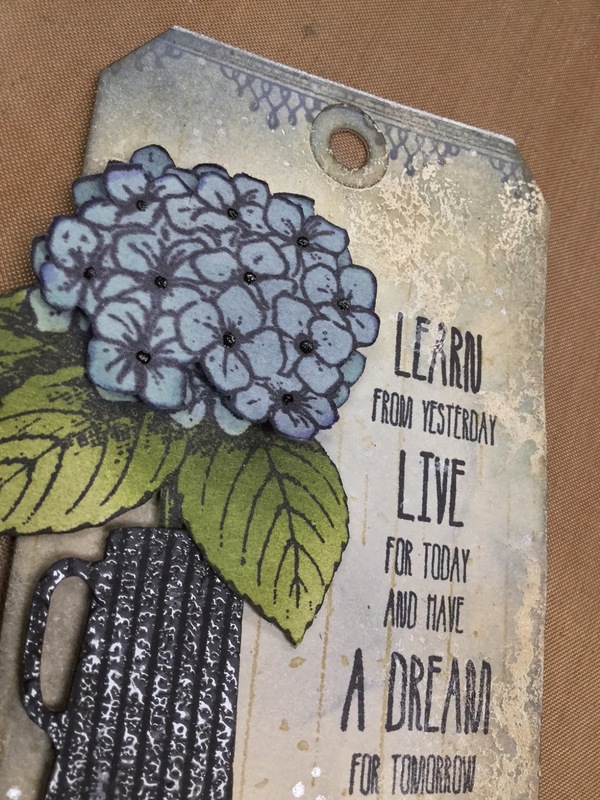 I am a total newbie to stamping but I'm so inspired by your work!!!! I can't wait to try these techniques. Thank you!!! 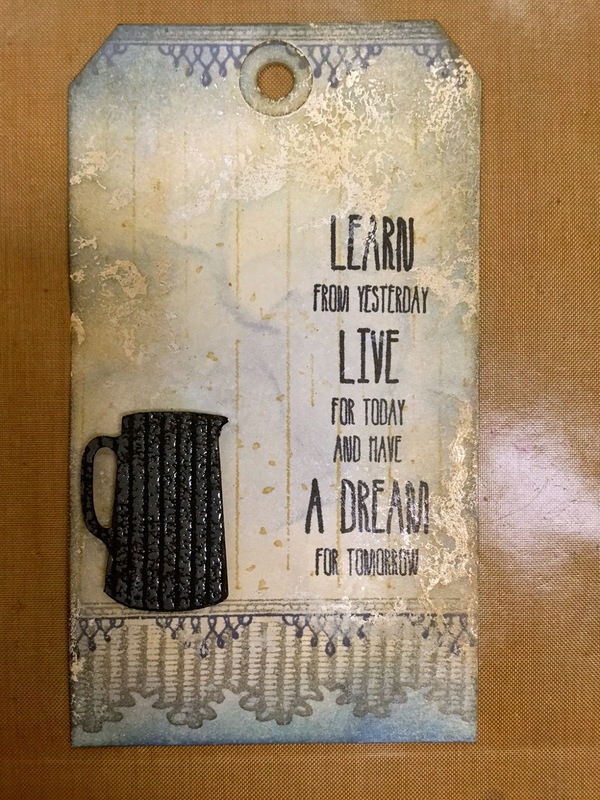 Love it...I love the chunky look and the stamps are awesome!!! That is such a cool effect, the ironing is going to have to wait another day - again! That is awesome!! I love your tags and I will definitely be giving this a try. I don't have the spray but time for some good old experimenting. I live in the boonies up here so making do is what I do. LOL! I would also be beyond thrilled to make a nice new home for that gorgeous stamp set too! This technique is absolutely genius Wendy, just love the plaster effect. Must try this, am thinking of pink and purple as I'm a bright colour person. Would love to give Megan a home and I adore the border stamp, it's so delicate looking. I love the tea rose and tree branch tag colors. This is going to be fun to try. Think I am going to have to buy more ink. Your tag is beautiful. Love the colors and idea!!! I love this technique and the results are great. 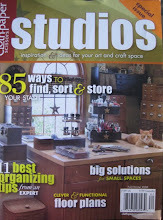 I'm thinking of having a look at my stash and seeing if I have violet and yellow dye inks to try with the picket fence. At least I'll have fun experimenting. 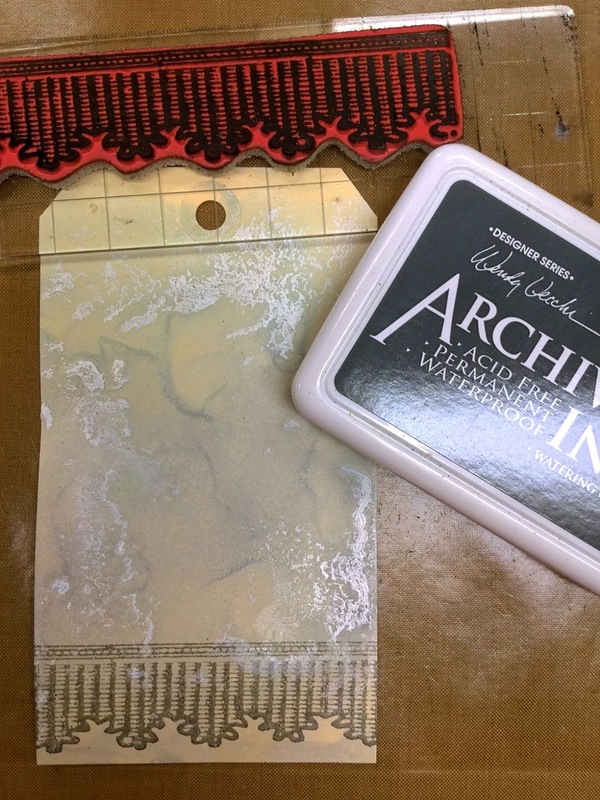 WOW Wendy... this technique is awesome and I really appreciate you sharing this because I have tons of inky supplies but never know what to do with any of them. I'm one of those who struggle with what to do. Your finished tag is absolutely DIVINE! I LOVE it! And I really like how the other tags came out after trying other inks. Just beautiful! Thanks so much for your creativity and the inspiration! I can't wait to try this in my art journal and make a few tags. What a fun background and love the ruffle and lace border. What a great technique! I can't wait to try the plaster effect. Thank you for the chance to win the stamp set. Love your art! I LOVE this technique!! It is so awesome!!!! I am going to try it today....and as for the ruffle stamp? I would LOVE to win that!!!! Thanks for the chance. Amazing technique. Must be that chemistry you took years ago. As I was watching the tag come together I just knew it was going to be amazing. Thanks for a new play thing! You have the best ideas, Wendy! Don't know how you think them up but I love them. Keep up the good work. Now I have to go and try this! 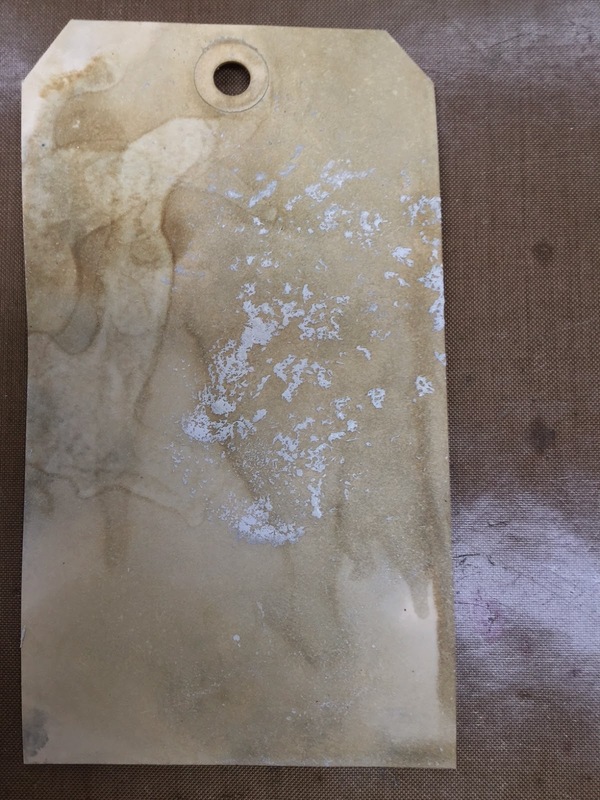 Who would ever think that spraying inks on a mat, then alcohol, then swipe the paper through, what looks like a complete mess, would turn out so fantastic. Great ideas flow through your brain and down to your fingertips! I really like this technique Wendy and thanks for sharing. Awesome! You make it look sooo easy! I love the tag, but especially before stamping, etc. what a great background. Would like to try it using pen over it instead of stamping. It would make a great journaling tag. Looks like fun, and the finished results are beautiful. I think I need to try it! I just love it when new ideas are born and yours is a winner! *thud* this is AWESOME! Can I come and sit next to you and maybe just touch your arm for a few hours, I mean seconds, then maybe some of your brilliance will soak through into me? Stalkerish? Um... yesh! LOVE this Wendy.. you ROCK!!! Fun technique with great results. The color combos you tried look great on the tags. Love those big Hydrangeas and the cute little pitcher. Thanks for sharing these new tips with us. Love this new technique and finished tag, I will be trying this real soon. I think not only will I try our color combos but I would like to try Watering Can and Cornflower Blue together. Thanks so much for sharing and a chance to win your gorgeous new stamp with Megan!! She is gorgeous !!! That is one cool technique & the finished tag is gorgeous. Oh my... LOVE this tutorial and am going to give it a try! The colour combinations are so lovely and those new stamps look fabulous! The end result is beautiful Wendy! I'm gonna try this technique right now! So glad you're giving away this set ... I wanted it, but I could only pre-order so much you know! haha C'mon Rick! So so gorgeous, thank you for sharing. wow!! this looks like such a cool technique! I do want to try it. =) thank you for the chance to win too. 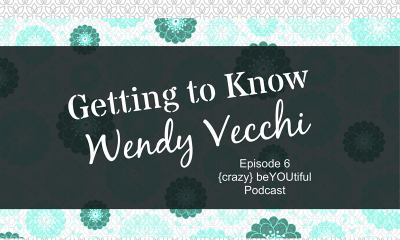 Wendy, you are such an inspiration! I love your ART! Thank you for this opportunity to make my ART!! What a great experiment!!! I love the texture you achieved! I'm still slowly adding your archival inks but might give this a try once I have some good color conmbos. what great result! i can't leave a long comment because in my excitement I have to go and try this out too! thank you for sharing! I wish I could get inside your head during one of your creative play sessions, Wendy. You are such inspiration to so many people! I would like to see what Tea Rose and Leaf Green or Tea Rose and Fern Green look like with the picket fence. I ran out of the picket fence spray, so it'll be a little while before I can try it. And, I am now in love with your ruffled border stamp. Gotta have it!!! Love this!! Always love techniques with supplies I already have! Thanks, Wendy!!!! Yes, you have inspired me to try this technique! Thanks for sharing your creativity! Just found your page and Love,love,love your tags! I will definetly be checking back. Would love to win your giveaway. 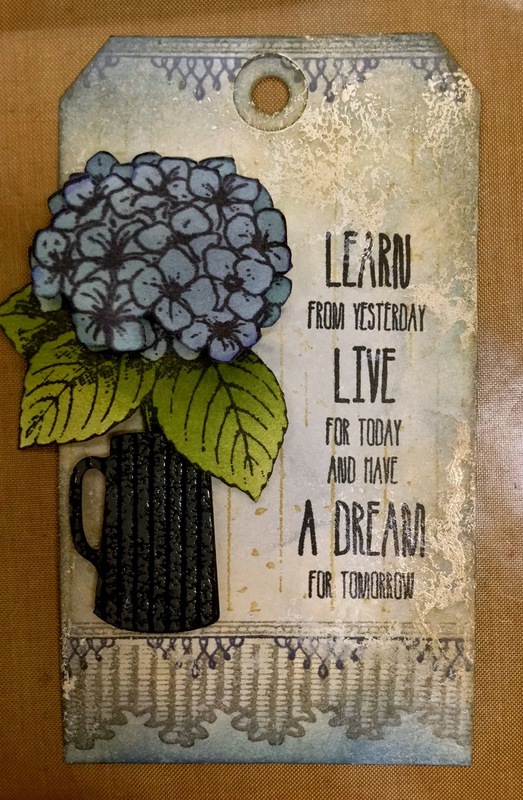 Great ideas - love the way you did the flowers - reminds me a bit of doing paper tole - definitely adds more dimension and they don't look just layered. Oh Wendy I love your plaster technique!! Fantastic look! Geeeeeorgeous. I love that ruffles stamp. That would be awesome to use on some square shrines to make curtains for a stage piece. I'd love to win it but if I don't I'm gonna have to start saving my pennies for that set, and Megan is just super Hot. I'm looking forward to giving this a try. Thanks for sharing these ingredients and wonderful technique and how to do this. Awesome art, as always and I will have to get those products to try that technique! Thank you for all the sharing! The technique is marvelous. i don't have any of the sprays yet but I definitely want to get it and try! I need more archival colors too! Love this idea!